Years ago we removed a prickly pear from the eastern boundary of the bushland - looked like it had been dumped. We haven't seen a prickly pear since ... then, today we came across two of them! Vicki joined us today - told us about some potential problems - vetch growing near the noticeboard, fox holes to deal with, and a few bulb species. The spring showers have been great for orchids this year. 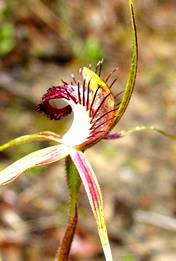 This is one of the spider orchids currently out - looks like a 'Rusty Spider Orchid' Caladenia sp..